M. King Hubbert was a big-name geologist who worked much of his career for Shell oil. 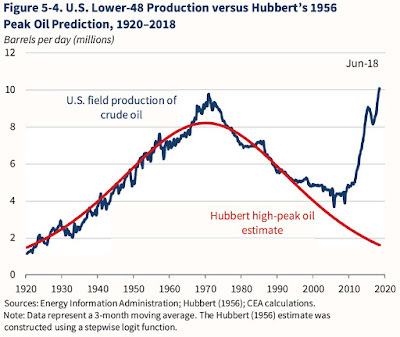 Back in the 1970s, when OPEC taught the US that the price of oil was set in global markets, discussions of US energy production often began with the "Hubbert curve," based on a 1956 paper in which Hubbert predicted with considerable accuracy that US oil production would peak around 1970. 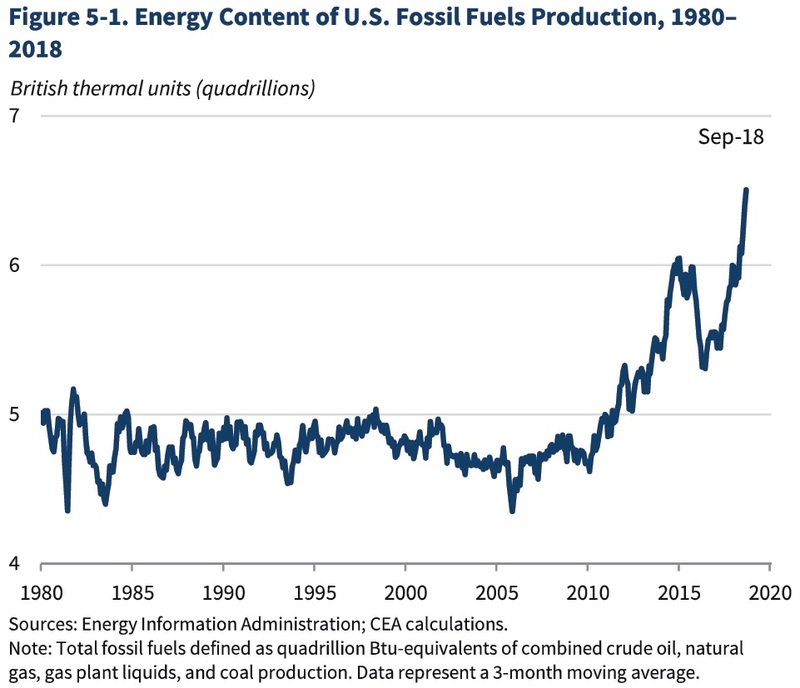 The 2019 Economic Report of the President devotes a chapter to energy policy, and offers a reminder what happened with Hubbert's curve. The red line shows Hubbert's predicted oil production curve from 1956. The blue line shows actual US oil production in the lower 48 states. At the time of Hubbert's death in 1989, his forecast looked spot-on. Even by around 2010, his forecast looked pretty good. 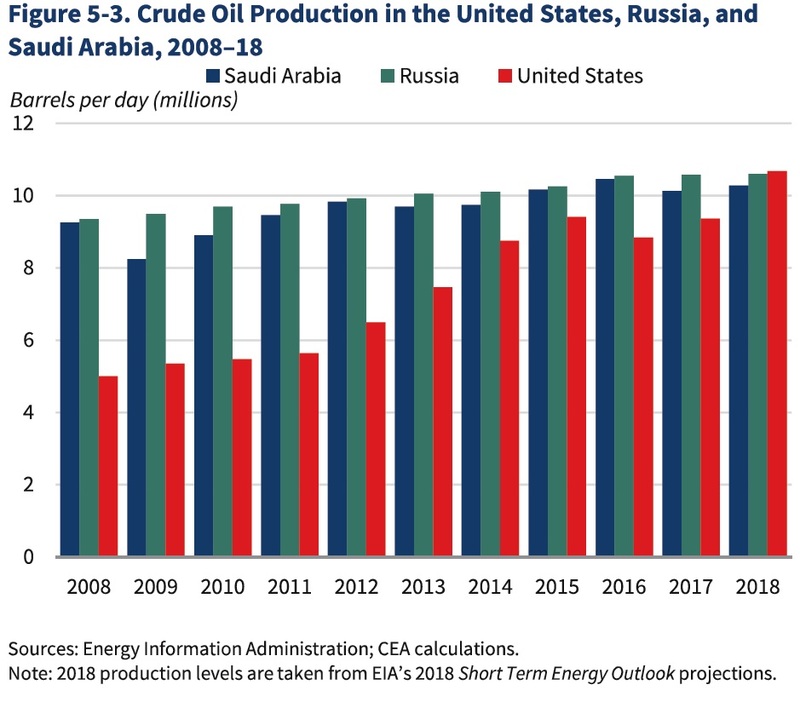 But for those of us who had built up a habit since the 1970s of looking at US oil production relative to Hubbert's prediction, the last decade has been a dramatic shock. 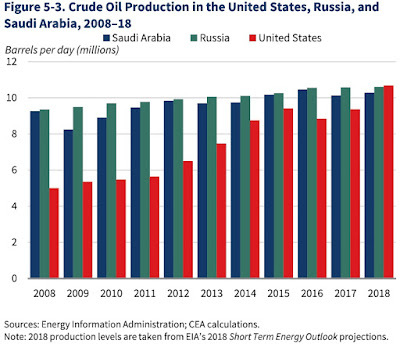 Indeed, domestic US oil production now outstrips that of the previous world leaders: Saudi Arabia and Russia. 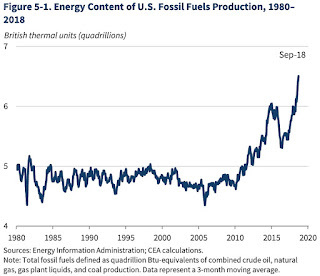 The surge in US fossil fuel production is about natural gas as well as oil. Here's a figure which combines output of all US fossil fuel production, measured by its energy content. You can see that it's (very) roughly constant from the 1980s up through about 2010, and then everything changes. Many Americans are ambivalent about fossil fuel production. We demonstrate our affection for it by driving cars, riding in airplanes, and consuming products that are shipped over US transportation networks and produced with fossil fuels (for many of us, including electricity). People who live in parts of the country that are active in fossil fuel production often like the jobs and the positive effects on the local economy. On the other side, many of us worry both about environmental costs of energy production and use, and how they might be reduced. 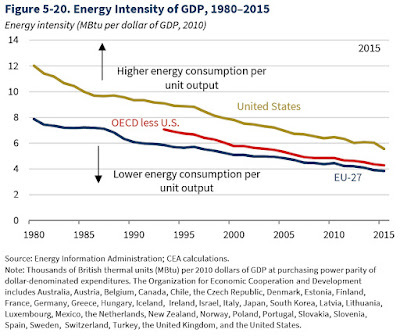 Big picture, the US economy has been using less energy to produce each $1 of GDP over time, as have other high-income economies like those of western Europe. 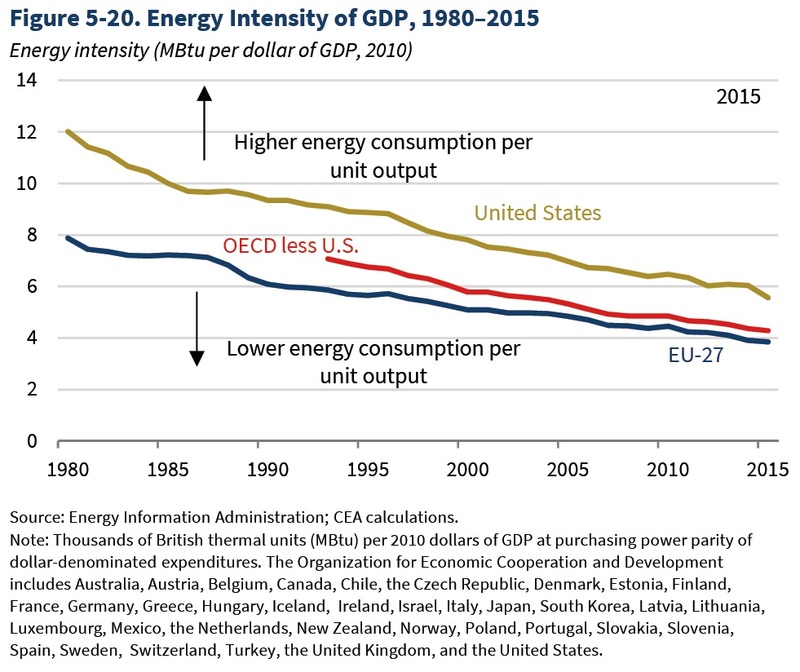 My guess is that the higher energy consumption per unit of output in the US economy is partly because the US is a big and sprawling country, so transportation costs are higher, but also that many European countries impose considerably higher taxes on energy use than the US, which tends to hold down consumption. The US could certainly set a better example for other countries in making efforts to reduce carbon emissions. 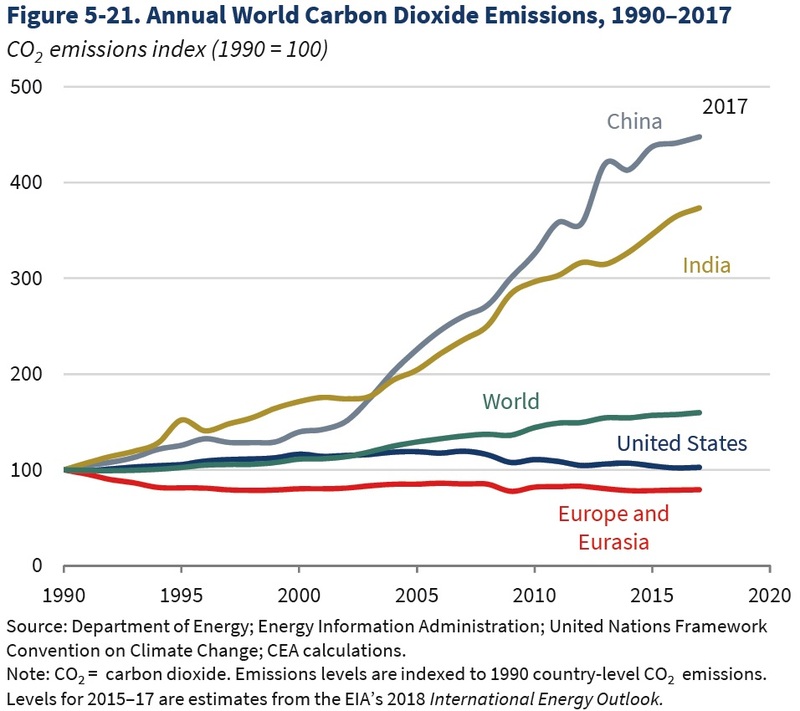 But that said, it's also worth noting that US emissions of carbon dioxide have been essentially flat for the last quarter-century. 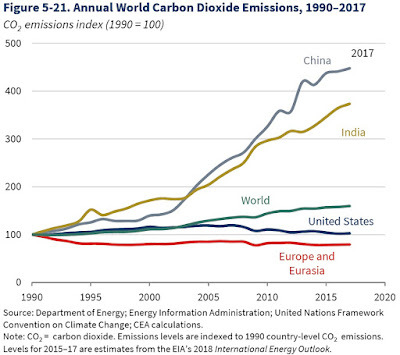 More broadly, North America is 18% of global carbon emissions, Europe is 12%, and the Asia-Pacific region is 48%. Attempts to address global carbon emissions that don't have a heavy emphasis on the Asia Pacific region are missing the bulk of the problem. Overall, it seems to me that the sudden growth of the US energy sector has been a positive force. No, it doesn't mean that the US is exempt from global price movements in energy prices. As the US economy has started to ramp up energy exports, it will continue to be clear that energy prices are set in global markets. But the sharp drop in energy imports has helped to keep the US trade deficit lower than it would otherwise have been. The growing energy sector has been a source of US jobs and output. The shift from coal to natural gas as a source of energy has helped to hold down US carbon dioxide emissions. Moreover, domestically-produced US energy is happening in a country which has, by world standards, relatively tight environmental rules on such activities. A version of this article first appeared on Conversable Economist. We don't need Saudi Arabia's oil anymore, they are no longer our puppets. America is better off without them. Great news, I am so delighted. God bless our President !! Timothy Taylor is an American economist. He is managing editor of the Journal of Economic Perspectives, a quarterly academic journal produced at Macalester College and published by the American Economic Association. Taylor received his Bachelor of Arts degree from Haverford College and a master's degree in economics from Stanford University. At Stanford, he was winner of the award for excellent teaching in a large class (more than 30 students) given by the Associated Students of Stanford University. At Minnesota, he was named a Distinguished Lecturer by the Department of Economics and voted Teacher of the Year by the master's degree students at the Hubert H. Humphrey Institute of Public Affairs. Taylor has been a guest speaker for groups of teachers of high school economics, visiting diplomats from eastern Europe, talk-radio shows, and community groups. From 1989 to 1997, Professor Taylor wrote an economics opinion column for the San Jose Mercury-News. He has published multiple lectures on economics through The Teaching Company. With Rudolph Penner and Isabel Sawhill, he is co-author of Updating America's Social Contract (2000), whose first chapter provided an early radical centrist perspective, "An Agenda for the Radical Middle". Taylor is also the author of The Instant Economist: Everything You Need to Know About How the Economy Works, published by the Penguin Group in 2012. The fourth edition of Taylor's Principles of Economics textbook was published by Textbook Media in 2017.